The theatrical Oscar competition has started in Ukraine! It will finish in November! Experienced theater scholars, experts on the international festival movement Anna Lypkivska and Anna Veselovska worked on the development of the concept and the statute of the award. Taking into account the experience of holding such events in other countries, they developed their own scheme for the format of the festival-award. It involves two components of the event which are to work very productively: the festival part features the best performances entering the final, while the prize part sees the award ceremony for the winners. Incidentally, in addition to honorary diplomas, the winners will receive monetary prizes to enable them to realize new creative projects. The name of the festival-award is similar to the Ukrainian word hra that denotes the basis of the theatrical art, meaning “play” and “game,” but at the same time GRA is a fictitious abbreviation standing for the Great Real Art. So the bar has been set high, as the event will accept only great and real art! Determining the quality of “great and real” entries was entrusted to 10 leading theater scholars and musicologists. An expert group consisting of Anna Lypkivska, Anna Veselovska, Maia Harbuziuk, Serhii Vasyliev, Oleh Verhelis, Liubov Morozova, Liudmyla Oltarzhevska, Yana Portola, Anna Stavnichenko, and Alla Pidluzhna reviewed videos of 74 entries submitted by theaters. They created a longlist of five performances in each of six nominations. The nominations included the entire traditional creative spectrum: the Best Drama Performance, the Best Performance for Children, the Best Musical Performance in the Genres of Opera/Operetta/Musical, the Best Choreography/Ballet/Plastic Performance, the Best Chamber Scene Performance, and the Best Search and Experimental Performance. After watching live performances of all the first stage entries, a shortlist of two performances in each nomination was created. The work of the expert group ended there. This fall, an authoritative international jury will determine the winners. In the Best Drama Performance nomination: Chernihiv Shevchenko Ukrainian Music and Drama Theater’s Vii. A Docudrama, Kharkiv Afanasiev Academic Puppet Theater’s The Imaginary Invalid and Zakarpattia Hungarian Drama Theater (Berehove)’s drama RH+. In the Best Chamber Scene Performance nomination: the Wild Theater (Kyiv)’s Vitalik and the Golden Gate Theater (Kyiv)’s Daddy, Did You Love Me? In the Best Performance for Children nomination: Chernihiv Dovzhenko Puppet Theater’s The Little Angel Who Lost a Star and Dnipro Actor and Puppet Municipal Puppet Theater’s The Dereza Goat. 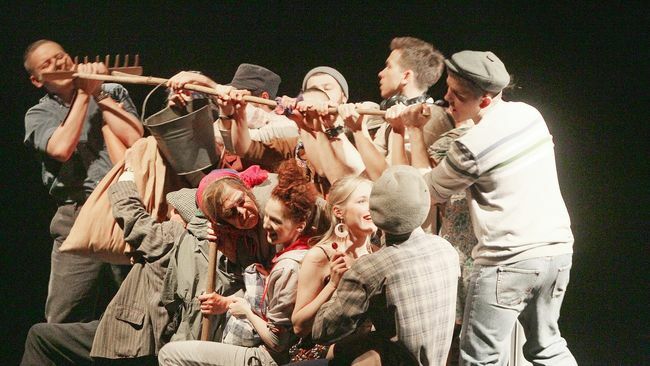 In the Best Musical Performance in the Genres of Opera/Operetta/Musical nomination: the Open Opera Ukraine NGO (Kyiv)’s Dido and Aeneas and Mykolaiv Ukrainian Drama and Musical Comedy Theater A Square Peg in a Round Hole. In the Best Search and Experimental Performance nomination: Ivano-Frankivsk Franko Ukrainian Music and Drama Theater’s Hamlet and the joint project of Kyiv National Theater of Operetta and the Theatrical Platform NGO Under the Blue Sky. In the Best Choreography/Ballet/Plastic Performance nomination: Kryvyi Rih Academy of Motion Theater of Musical and Plastic Arts’ Tempted by Thirst. The experience of holding the first All-Ukrainian GRA festival proves the fruitfulness of the efforts of its organizers. Despite all the difficulties that pioneers usually encounter, the event still took place. It showed theatrical Ukraine in its new aspects, uncovered an actual picture of the contemporary Ukrainian theater in its various, unexpected, experimental stage manifestations. One can argue about its quality, level of achievements, originality of solutions and innovations offered, but this is what we have now. Of course, it will be different tomorrow. This progress reflects our development path, gives hope for change and creative discoveries. Having the incentive to join the GRA (or Game), the actors and directors will strive to prove their superiority and originality, the experts will be able to analyze the state of the Ukrainian theater art, and the spectators will follow the development of modern theater and receive aesthetic pleasure. Such parades of Ukrainian theaters’ stage productions reassure one that the Theater is immortal! It is difficult to evaluate creative processes. Expert reviews, audience preferences, opinions of professionals are subjective, varied, and multi-vectored. However, this is just how it should be. We need to perceive theater with our minds and hearts. And do not argue with the great William Shakespeare! Yes, “all the world’s a stage”! And we are all part of the GRA/Game!